Chris Begay (left) and Genevieve Gonnie (right) are the owners of the L.A. Fresh Grill in Leupp, Ariz.
You can see Leupp from miles around, where it’s perched on a small plateau overlooking the high desert. Surrounding the town are dozens of small houses, each spread over several acres. Cows look up from grazing on small patches of yellowed wild grass to watch my car speed down the rough, two lane road leading into town. On Leupp Road — the only named street in the tiny town of 1,605 — across a two-and-a-half foot deep trench filled with rainwater, sits an 18-foot trailer with a flashing LED sign in the window reading “Open.” Behind it, the Leupp Boarding School looms like a fortress and the spire of the Church of Jesus Christ of Latter-day Saints pierces the clear blue sky. In comparison, the trailer looks insignificant, but it is the home of an unlikely success story. The smell of hamburgers and deep fried onion rings wafts over the whole area around the trailer, attracting several dogs. One car after another braves the deep puddle to get there. I follow suit, figuring that the locals know best. Inside, Chris Begay and Genevieve Gonnie are busy preparing a brown bag special for a customer. In between orders, we chat about their business. “We’ve been doing this for what? 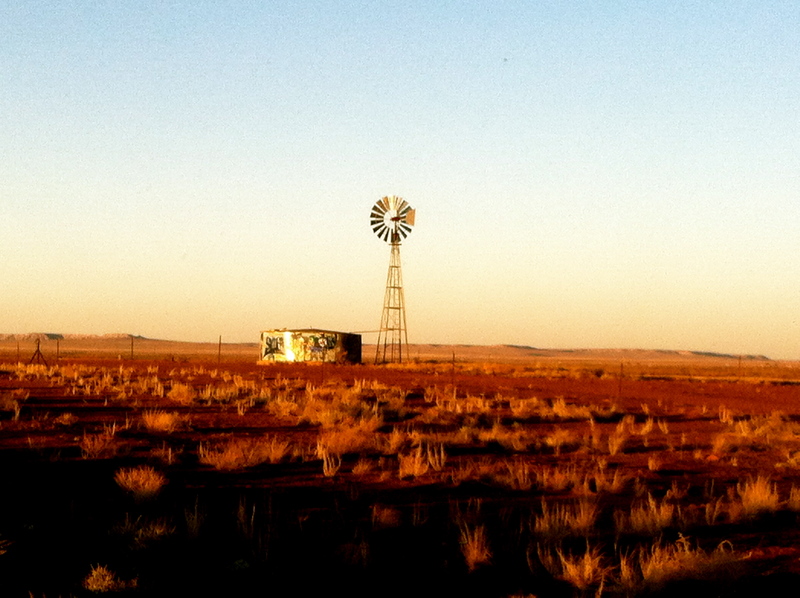 Three… Four… Four-and-a-half years?” Begay says, looking to his business partner. “Yeah, four-and-half years,” Gonnie confirms. 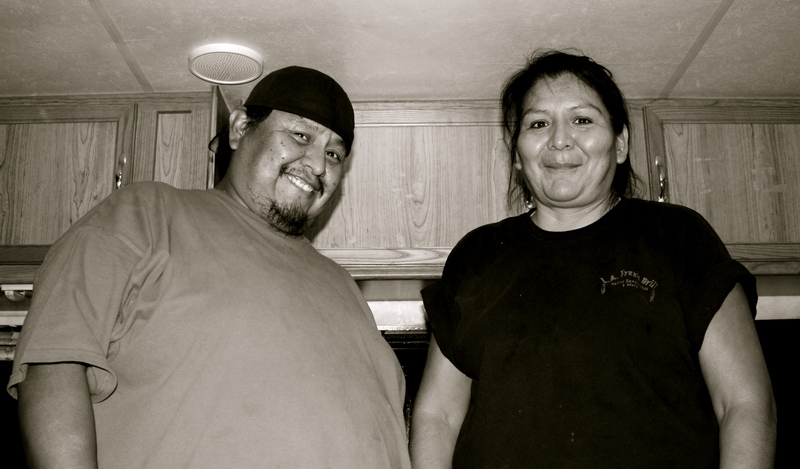 Begay and Gonnie are the co-owners of L.A. Fresh Grill. They started by offering free fry bread to people who filled out credit applications back when they both sold cars. They soon found that they could make more money selling their food than they could on commission and so they set up on the side of the road one day with some fry bread. Three hours later, they sold out. Eight months later, they had enough money to buy their trailer. They consider themselves fortunate to have done so well for themselves. Some of the other vendors parked around here have been selling the same thing for 20 or 30 years and still drive the same broken down vehicles, Begay says. “—And Canada,” his aunt, who often comes to visit, interjects. 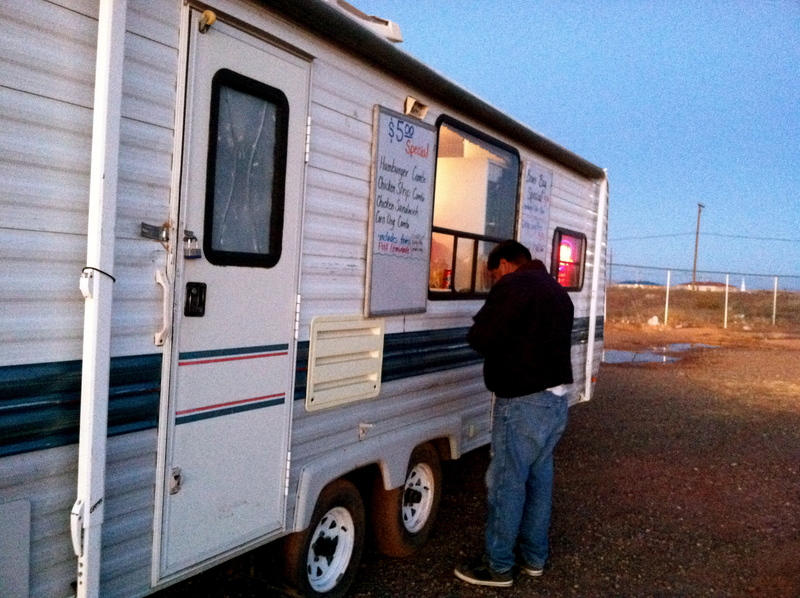 Jonathan Yazzie orders onion rings at the L.A. Fresh Grill in Leupp, Ariz. Photo by Jonny Eberle. When asked about the state of the state of the economy in the area, though, their smiles fade a little. L.A. Fresh Grill has seen a decline in its clientele over the past year. “It’s the economy,” Gonnie says, shaking her head bitterly. Still, things are looking up for the pair. They have hopes of opening a permanent cafe, but it’s hard to get around the bureaucratic red tape. Jonny Eberle is a writer, photographer, filmmaker and social media manager in Flagstaff, AZ, where he enjoys referring to himself in the third person. You can follow him on Twitter at @jonnyeberle.